The Virginia G. Piper Center for Creative Writing at ASU is proud to offer four creative writing classes through the Piper Writers Studio. Classes are taught by acclaimed and award-winning writers from the community, and cover topics such as first-draft novel writing, novel revisions, persona poetry, and creative non-fiction. Michael A Stackpole, a New York Times best-selling author known for his extensive fantasy and science fiction work in the Stars Wars, Conan, and World of Warcraft universes. Stackpole will be teaching Winning NaNoWriMo Tuesdays, October 4 – 25, 2016 from 6 – 8 p.m.
Carol Test, an award-winning short-story writer and former editor in chief of the Sonora Review who has taught workshops for the University of Arizona, Arizona State University, Phoenix College, and Mesa Community College. Test will be teaching Remodel Your Novel: Five Key Scenes for Fiction Writers Wednesdays, October 5 – 26, 2016 from 6 – 8 p.m.
Marshall Terrill, veteran film, sports, music, history and popular culture writer with over 20 books to his credit, including bestselling biographies of Steve McQueen, Elvis Presley, and Pete Maravich. Terrill will be teaching Beyond the Facts: Writing Compelling Non-fiction Wednesdays, October 5 – 26, 2016 from 6 – 8 p.m.
Lois Roma-Deeley, an author with three collections of poetry and numerous publications in anthologies in journals who founded the creative writing program at Paradise Valley Community College and received an Artist Research and Development Grant from the Arizona State Commission on the Arts in 2016. Roma-Deeley will be teaching Another Voice: Creating Memorable Poetic Personas Saturday, October 22, 2016 from 9 a.m. – 1 p.m. Classes are open to individuals of all backgrounds, skill levels, and experiences, and are designed to fit around the schedules of working adults (taking place weekday evenings or weekend afternoons). Most classes are held at the Piper Writers House, the historic President’s Cottage on the ASU Tempe Campus. Class sizes range between 8 and 12 students in order to ensure an intimate, individualized educational experience, and start at $75 (with discounts for individuals who are members of the Piper Circle of Friends). Classes can also qualify for professional development credit with the Arizona Department of Education. Individuals can register for classes through the Piper Center’s website until Monday, October 3rd, 2016. For more information, please visit the Piper Center’s website at http://piper.asu.edu/programs/piper-writers-studio/current-courses. Poets Sarah Vap, Dexter L. Booth, and Patricia Colleen Murphy will read from their recent work at Hayden Library on the Tempe Campus as part of the MFA Alumni Reading Series, presented by ASU’s Creative Writing Program. The event takes place on Thursday, September 22nd. Doors open at 6:30 p.m. and the reading begins at 7:00 p.m. A book signing and reception with light refreshments will follow the reading. Sarah Vap received her MFA from Arizona State University. Vap is the author of six collections of poetry. Her most recent book, Viability, was selected by Mary Jo Bang for the National Poetry Series, and was released by Penguin in 2016. Dexter L. Booth earned an MFA in creative writing from Arizona State University. His collection Scratching the Ghost was selected by Major Jackson for the Cave Canem Poetry Prize. Patricia Colleen Murphy, a graduate of ASU’s MFA Program in Creative Writing, founded Superstition Review at Arizona State University, where she teaches creative writing and magazine production. Her collection, Hemming Flames, was selected by Stephen Dunn for the May Swenson Poetry Award. The event is free of charge and is open to the public. For more information please visit the ASU page and/or the Facebook event. The Arizona State University Department of English invites you to an open house in celebration of the RED INK International Journal of Indigenous Literature, Arts, & Humanities. There will be indigenous food, and refreshments, along with poetry, stories, and music. This event is free of charge and is open to the public. The event takes place on Friday, September 16th from 5:00 p.m. – 7:00 p.m. at the Durham Language and Literature Building (LL), room, 215, ASU Tempe Campus. For more information visit the Facebook event or the official event page. Marooned Undergraduate Creative Review Reading: Show Us What You Got! 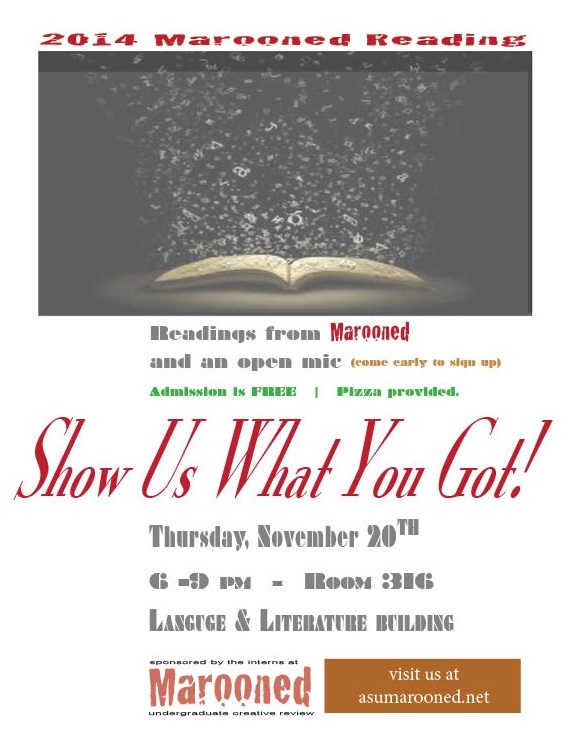 Next Thursday, November 20th, Marooned Undergraduate Creative Review will be hosting their annual reading to celebrate their most recent issue at Arizona State University’s Tempe campus in room 316 of the Durham Language and Literature building from 6-9 pm. We are excited to present the amazing work from some of our 23 contributors for Volume 12. So far, our lineup of readers includes Jillian Mason, Jessica Swarner, and Kevin Hanlon. Then following the scheduled readings, audience members will be able to perform in our open mic session. If you are interested in reading at the open mic, you should arrive a little early to sign up. We will be providing food and drinks. Attendance is free and open to the public. 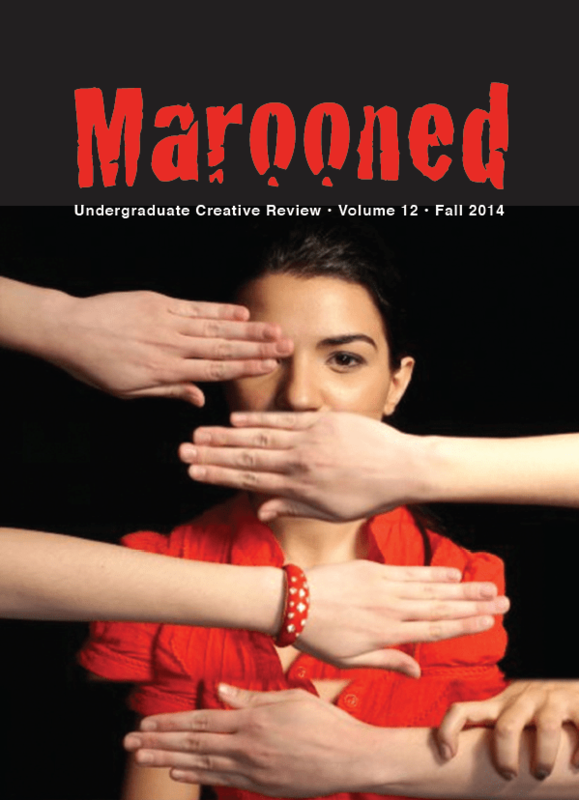 Marooned is a literary magazine supported by the Arizona State University Department of English. We are currently run by five undergraduate interns and supervisor Bob Haynes. We accept submissions in poetry, fiction, essay, photography, and art starting in the fall semester until our submission deadline on April 1st. Copies of our current and past issues are available for purchase for $5 from our interns on ASU’s Tempe campus, and will be available at our reading. Come join us for a fun evening in celebrating contemporary literature from Marooned’s most recent issue. Michael Cohen is a student in Barrett, the Honors College at Arizona State University. He is pursuing a degree in creative writing and hopes to continue his writing education upon graduating, while working towards becoming a published author. He is also an editor for Marooned Undergraduate Creative Review. Elizabeth S. Hansen is a senior at Arizona State University Tempe pursuing degrees in creative writing and communication under Barrett, the Honors College, as well as a writing certificate. She is an intern for the literary magazine Marooned Undergraduate Creative Review, as well as Superstition Review. Her work has been published in issue 8 of Miracle Magazine. Upon graduation, Elizabeth plans to pursue a career in the writing and/or teaching industries. Tamara Ignatian is a senior pursuing her degree in English through Arizona State University online and is working as an intern on campus for Marooned Undergraduate Creative Review. Outside of school, Tamara reads anything that she can get her hands on and runs a poetry blog. After graduation, Tamara intends to further her education in the hopes of one day teaching English or editing professionally. Haley Marshall is a senior at Arizona State University’s New College of Interdisciplinary Arts and Sciences, pursuing a degree in English with a minor in film studies. Also a member of Barrett, the Honors College and an editorial intern atMarooned, she’s hoping to work in the publishing industry after graduation. Madison Ruffner is a junior at Arizona State University pursing a degree in English literature, as well as minors in both Business and Japanese. In addition to being an intern for Marooned Undergraduate Creative Review she has a passion for writing in both languages. After graduation she hopes to pursue a career in publishing in either language, in either Japan or the United States. Bob Haynes currently teaches professional and technical writing classes at Arizona State University and is Director of the Writing Certificate Program. He is also the faculty advisor for the student-run literary magazine Marooned. Bob has also written educational nonfiction for children and his works have been published in journals such as Bellingham Review, Cimarron Review, and elsewhere. His background includes journalism studies at the George Washington University, professional publishing at Stanford University, and creative writing at ASU. He retired from NASA in 1998 and has been teaching at ASU since 2002.